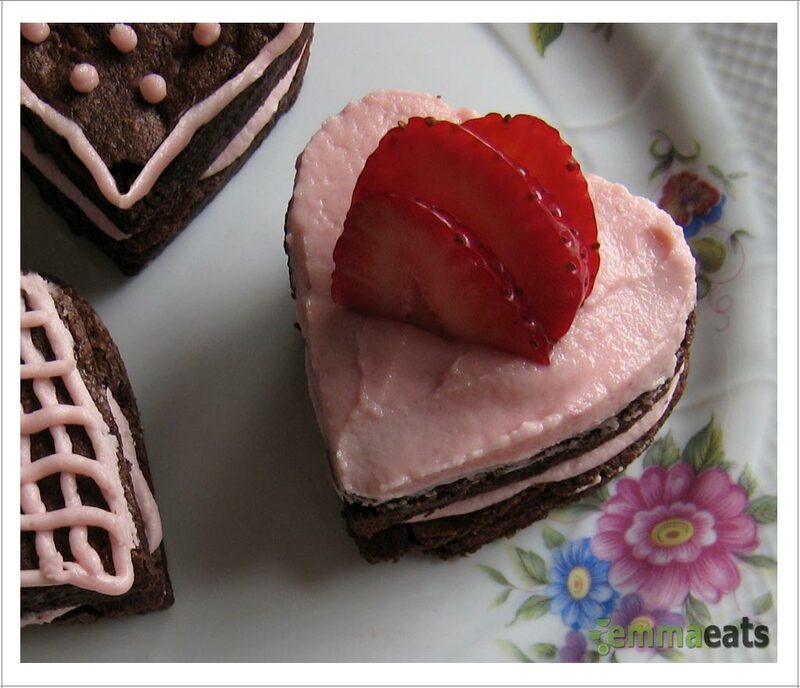 Let’s put our hearts together – Double Chocolate Brownie Cakes | EmmaEats…and Katie too! Valentine’s Day is here. What are your plans? Originally, our family didn’t seem like we were up to more than helping Emma make a few cards which was a far cry from last year’s enthusiasm. We’re just back from a holiday, not quite back into our routine, the house is still in disarray and Katie’s sick. As of last night in fact, we still had the 20 Valentines for Emma to complete for her classmates. Thankfully something changed over the weekend – we had to have something delicious to mark today for the ones we love. I found inspiration easily – A Farm Girl Dabbles’ has a gorgeous Fudgy Brownie Hearts and Fresh Raspberry Buttercream post. Emma adores our brownie recipe which together, we have actually made into a rectangular cake with vanilla buttercream icing on a number of occasions. And, aside from blueberries, we had all the ingredients on hand. Together, Emma and I set to work to make our brownies with some alterations – using dark chocolate only and a healthy addition of ground flaxmeal(!). And if that wasn’t enough, the dairy-free frosting is coloured with beets, rather than red or pink artificial food colouring. You don’t have to make these cakes heart-shaped, but for this occasion, it just seemed right. In the end, Emma ended up being our taste tester and valiantly helped keep Katie entertained while the brownie cakes came together. These are fast, easy, look lovely and taste decadent. Sounds just about right for Valentine’s Day – freeing you up from the kitchen to spend time with your Valentines. In fact, I’m off to cuddle my Valentines right now. Line a 13″x9″ cake pan with parchment paper. Make sure to leave the edges long for easy lifting out of the pan when the brownies are cooled and ready to be cut. Preheat the oven to 350F. Melt the butter and chocolate, uncovered, in the microwave (half power for 1 min, then mix with a rubber spatula, then back into the microwave at half power for 45 seconds to 1 minute). Mix until melted completely. Add brown sugar, eggs and vanilla and stir until smooth. Next, sprinkle the flour, baking powder and salt over top of the chocolate mixture. Then add the chocolate chips. Combine until the white of the flour can no longer been seen in the batter (which will now be pretty thick). Spread the batter evenly into the prepared cake pan. Bake for 20-25 minutes. Remove from oven and cool completely in the pan before cutting. To prepare the filling, put the icing sugar and spread into a medium-sized bowl and whisk together until smooth (I did this on medium speed in my stand mixer, but it can be done with a hand mixer or by hand too.) Next, mix in the vanilla. Once the frosting is combined and smooth, add the beet pieces to it and gently mix it through the frosting, keeping the pieces intact. Once you have your desired pinkness, remove the beet pieces. Once the cake is cooled, cut the brownies into your desired shape (we used 3″ heart cutters and 1 1/2″ stars for our Valentine treats). Spread or pipe the frosting on to half of the cutouts. Gently place an unfrosted heart atop each frosted heart to create a mini-layer cake. Finish the cake with additional frosting and strawberries. Although the recipe uses Vegan Buttercream Icing, it’s easy to convert to regular buttercream by using the equivalent amount of butter instead of Earth Balance. Recently, I tried using coconut oil instead of vegan margarine and the results were fantastic (and vegan)! Oh these are so beautiful looking and I love that you are using beets instead of food dye. I’ve got a few beets lingering in the fridge, giving me the stink-eye every time I open the door. This sounds perfect. Thank you! I’ve been trying to come up with a way to do red and pink without using food dye and am thrilled this works for pink. And, on top of that, we rinsed off the beets afterward and just ate them with Emma. Those beets, they just keep on giving!